What Is Tomato-Based Barbecue Sauce and How Is It Used? What Is Tomato-Based Barbecue Sauce? Tomato-based barbecue sauce is so ubiquitous that many people don't know there are other styles. Most of the commercial sauces on the shelves of your local supermarket are based on tomato. It's what you expect to be served at the cookout or in takeout packets. Tomato-based barbecue sauce is a condiment primarily used with smoked or grilled meat or hamburger sandwiches. Beyond those traditional uses, barbecue sauce has become a condiment like salsa or ketchup and is often used as a dipping sauce or spread. While it can be prepared at home, many types of tomato-based barbecue sauces are commercially bottled. Tomato-based barbecue sauces can follow different regional styles. The Kansas City style is the thick, sweet, smoky sauce heavy in tomato that is often generically bottled as "barbecue sauce." The Memphis style is thinner. Often, sauces called Texas-style are spicier and less sweet. The central Texas style that is most often used on beef includes beef drippings and is thinner. The first barbecue sauces in America were Carolina sauces based on butter, vinegar, and peppers, and were primarily used on pork. Tomatoes weren't added to barbecue sauce until this style was developed in Memphis, Tennessee, where a wider variety of meats (including beef) were barbecued. These sauces were sweetened with molasses and were relatively thin. From there, the tomato-based sauce was brought to Kansas City in the early 1900s and the Kansas City style of thick, sweet, and spicy barbecue sauce was developed. This heavy tomato style became the one that was bottled and sold commercially. It is used on beef, pork, and chicken. Tomato-based barbecue sauce is a bold combination of tangy, sweet, spicy, and smoky flavors. While serious barbecuers disdain smoke flavoring, which they say should come from the smoke itself and not a bottle, it is expected by consumers. A barbecue sauce should be a flavor enhancer rather than so strong that it overpowers the meat. Why go to the effort to smoke or grill something if you are only going to taste the sauce? Tomato-based sauces should never be used during grilling. The natural sugars will caramelize and burn the surface of the meat at high temperatures. Sugars burn at temperatures well above the ideal smoking temperature so you can slather on sugar-based sauces to your barbecue as long as you keep the temperature below 265 degrees Fahrenheit (130 Celsius). Barbecue sauce can be added at the very end or at the table. Traditionally, people add barbecue sauce on their own to adjust the amount. 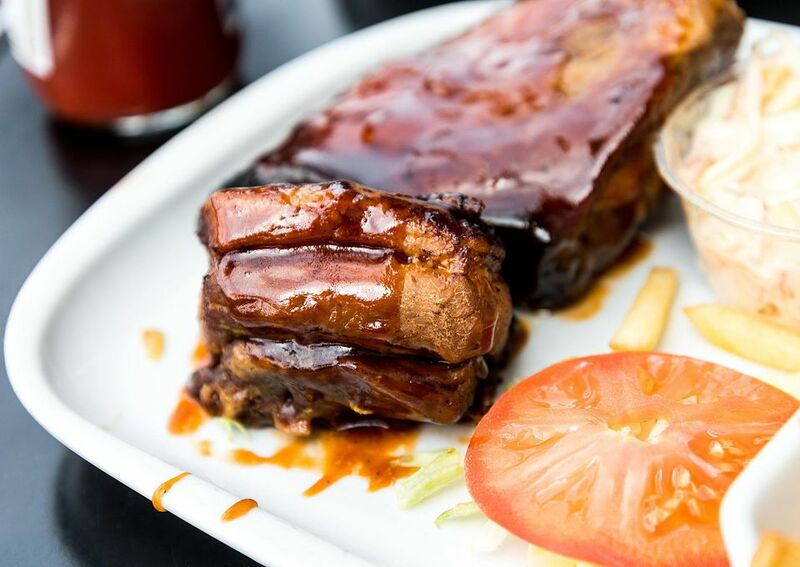 Besides being served as a side sauce or condiment, barbecue sauce can be used as a glaze or simmer sauce. A stroll to the condiment aisle of the supermarket will present you with plenty of choices among tomato-based barbecue sauces. Regional varieties may be available. To tone down the tomato flavor let the sauce simmer for 15 to 30 minutes before you use it. This will also give the sauce time to let the flavors blend together. To a saucepan, add the ingredients. Simmer for 15 to 30 minutes to give time for the flavors to blend so the tomato does not overpower the rest. Use immediately or refrigerate the sauce for a day before you use it. The acid in the tomatoes will further break down the ingredients and mellow the flavor. Store homemade barbecue sauce in the refrigerator. Unopened commercially-bottled barbecue sauce is stable at room temperature for the amount of time specified on the "Best By" date. Once opened, refrigerate the sauce. Commercially-produced barbecue sauce gets a bad health rating due to its high sugar and salt content. But thanks to the tomato base, it still provides minor amounts of vitamin A and beneficial carotenoids, including lycopene. Some brands such as Sweet Baby Ray's add citrus to their barbecue sauce to provide vitamin C. Making your own tomato-based barbecue sauce from tomato sauce, tomatoes, or tomato paste will ensure you get more of the benefits of tomatoes. As well, you can add less sugar and salt.